As a student, I was never big on lecture classes. I can remember only two teachers I enjoyed hearing lecture from the fifty or so from whom I've learned. My Shakespeare and Jane Austen professors in college were both so brilliant that listening to them speak was a gift in itself. I didn't need a lot of interactive activities and discussion to keep me intrigued. I knew I was listening to two of the foremost scholars in the world on their subjects, and everything they said was gold. For most of us creative teachers, who have not taken the path to become the foremost scholar in our field - not wanting to spend ten years reading everything there is to know about one author - lecture is an occasional necessary evil. At least that's how I feel about it. I have to exhaust every other potential way to get the information across before I will lecture. Because I HATE "the glaze." I hate to see students check their watches, finger the phones in their pockets, fight the head nod of understandable high school exhaustion. It makes me throw up a little in my mouth. Metaphorically speaking. But there are times when lecture is simply the fastest and easiest way to give students a treasure trove of important information. And this year I've discovered a strategy that can uplevel the lecture by making it far less one-sided. I know you know where this is going. 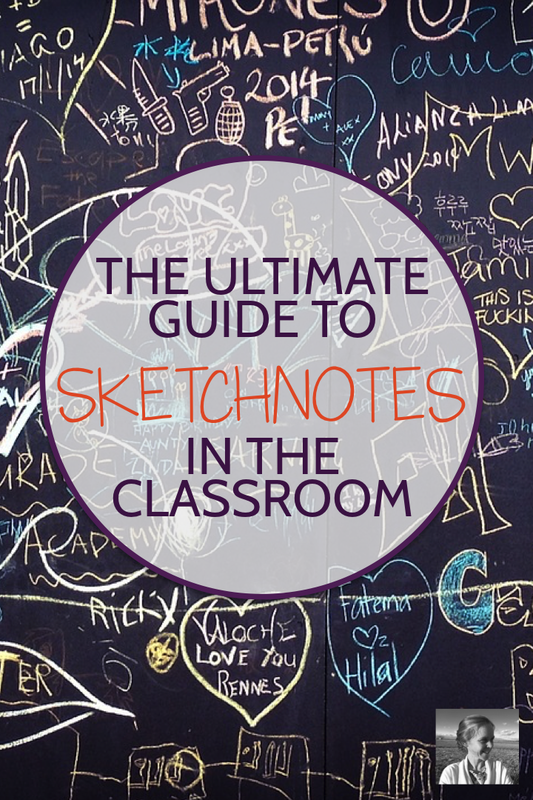 If you haven't heard of sketchnotes yet, I'm SO EXCITED to be the one to share it with you. 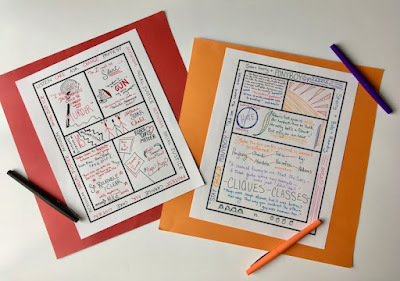 When you teach your students to take sketchnotes, you give them a method for listening to lecture that will allow them to process and remember it better, as well as have a chance to exercise their own creativity as they do so. And it's so easy. Start by showing students the video below. In just a few minutes, they can quickly pick up the basics of sketchnoting. When they take their notes, instead of writing drab bullet point after drab bullet point, they will spread ideas across the page, emphasizing key points with bold lettering, connecting thoughts with arrows and lines, adding containers like bubbles and shapes around key ideas, bringing the information to life with related sketches and symbols. Are you feeling it yet? I kind of want to go sprint around the school track, that's how excited I am about this. We're talking about making lectures FUN. Now maybe it seems like students will not enjoy this. Like maybe it would be too hard and too complicated. Not long ago, I posted the video above to the fabulous creative teachers in my Facebook group. One shared it with her students and then immediately asked them to try their hand at sketchnoting as they went through the play Othello. She shared the pictures below from their initial attempts. Awesome, right? I love what they came up with on just their first day of sketchnoting. 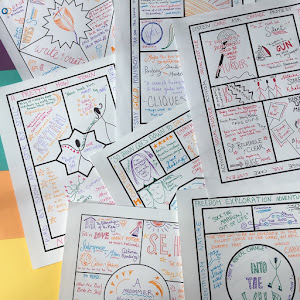 In an article for KQED radio called "Making Learning Visible: Doodling Helps Memories Stick," Katrina Schwartz explores the experiences of one school in introducing sketchnotes. My favorite part of the article shares how the director for learning design in one high school took sketchnotes during two lectures at his school. "'I sat through two 45-minute lectures in high school social studies and not only was I super focused because I was doodling, I could also basically give the lecture afterwards,' said Paul, who is director of learning design at Woodward Academy. 'And if I look at the doodle again today for three to four minutes, I can basically remember it all again.'" The article goes on to share how quickly the students at the school took to the strategy and how much it helped them remember. “'Teachers were amazed at the depth and diversity of what the kids produce, even the first time we tried this,' Paul said." Once students have learned the basics, you can invite them to sketchnote during video presentations (like Ted Talks), your own lectures, guest speakers, or school assemblies. 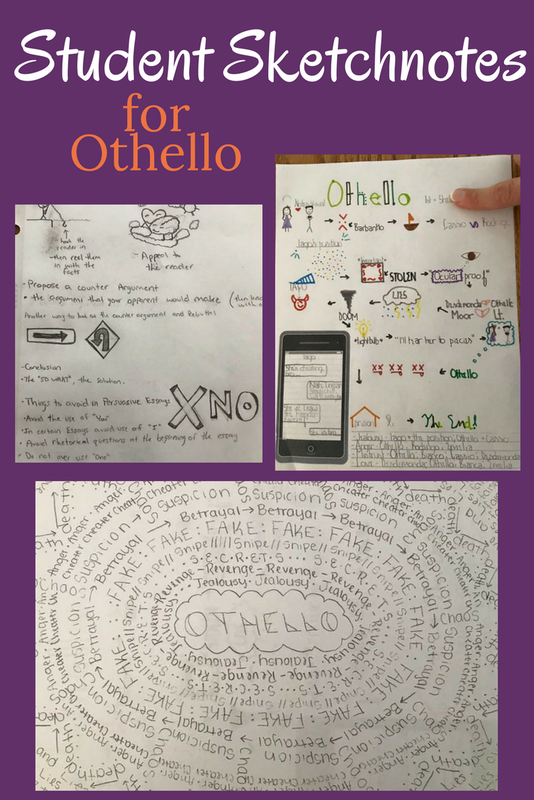 English students could also use sketchnotes as a tool to help them prepare for writing a paper. In this article I wrote for teachwriting.org, Sketchnotes: Paper Prep That's Fun, you can see how to use sketchnotes as an engaging prewriting strategy, and download a free packet to walk students through the process. 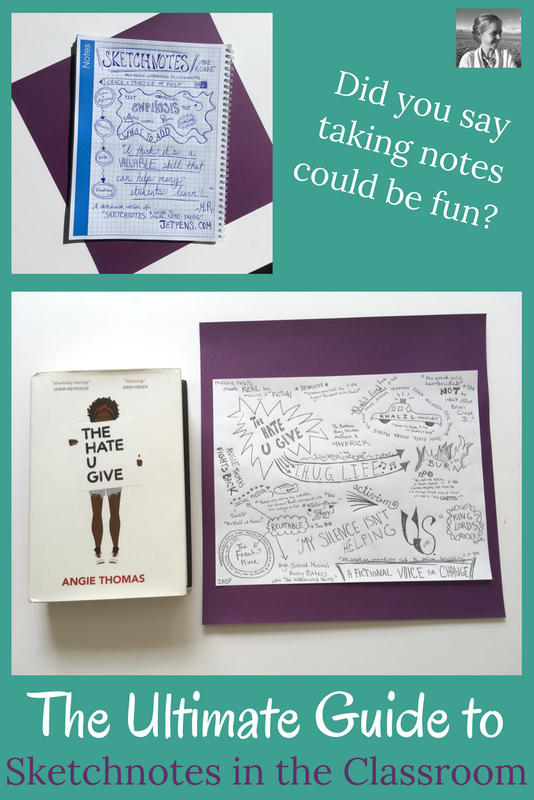 Below you'll see the sketchnotes I made about The Hate U Give. I had no idea what I would focus on in a paper when I began, but slowly the themes I was most interested in emerged as I sketchnoted the text. There are so many ways to incorporate this simple and fun technique into your day-to-day lessons. To see ten great examples of sketchnotes from Instagrammers and ten related assignment ideas involving sketchnotes, check out this post I wrote for We Are Teachers: 10 Creative Ways to Use Sketchnotes in your Classroom. This will take you still deeper into the strategy. Want to follow a blog that's exclusively about sketchnoting? Check out Sketchnote Army. On this site Mike Rohde (creator of Sketchnotes) and his team share examples of sketchnotes from around the world, as well as a podcast on the subject. If you're still on the fence, just give it a try for one day and see what happens. Showing the video is such a short commitment - what do you have to lose? Let your students try this strategy, and then swing over to my Facebook group, Creative High School English, and let us know how it goes! I would love to see your photos. Have you joined my e-mail community yet? Sign up below for insider freebies, fun classroom ideas, and podcast and blog post highlights delivered to your inbox, and you'll also get four free one-pager templates with complete instructions! One-pagers are a close cousin of sketchnotes, so this is a great activity to complement your introduction of sketchnotes.